Home » JOURNAL » Let’s talk tech! The Professional Bicycle Mechanics Association, led by president James Stanfill, exists to promote, develop, and facilitate the education of professional bicycle mechanics. Throughout the year, PBMA hosts several Technical Workshops in key locations to provide mechanic professionals with 27 hours of continuing education sessions in addition to opportunities for professional development and networking. Major industry brands from every segment of the cycling industry are invited to attend to showcase and educate professionals on proprietary products, tools, and technologies. Cane Creek’s Alex Dawson (Technical Sales Engineer) and Andrew Slowey (Manager of Rider Engagement) hit the road to educate attendees at the Atlanta workshop on January 7th-10th, 2019. Considering that Cane Creek Cycling Components offers a wide array of products ranging from ultra lightweight headsets, brakes and seatposts to Enduro World Series-ready front and rear suspension and nearly indestructible titanium cranks, Alex and Andrew agreed that preparing to cover a wide range of information, field a cornucopia of questions, and build excitement around proprietary tech was key to a successful course itinerary. They dialed in focus on basic proprietary technologies and product features, but also shared their favorite “tips and tricks” to engage both experienced, tech-savvy mechanics as well as mechanics less familiar with Cane Creek’s products. In addition, Alex and Andrew were able to share the passion all Cane Creek employees have for creating great products. Alex and Andrew share a few of their favorite tech tips below, but we encourage to you seek the help of your local Cane Creek dealer for bike/product fitment or adjustment questions and a Cane Creek Certified Service Center or our Factory Direct Service Center for all fork and shock service. Alex “Mr. Safety” Dawson always says:Before removing the HELM’s lowers, always remove the air from the positive and negative air springs. This can be done by simply pushing the negative air charge button while simultaneously releasing the air from the forks air valve. While performing a travel change on a HELM Air: After unthreading the air seal head, do not pull the air piston past the threads located within the stanchion tube. Also, during reinstall, remember to adhere to the air seal head torque specs. A good way to test the quality of a shock’s DU (or Norglide) bushings: Remove the shock from the frame. If you can easily rotate the shock’s reducer hardware with your fingers, you should install new bushings. The DU bushings that lie between your shock’s end eye and the reducer hardware exist to protect internal components to the shock and are the intended wear points, thus they are designed to be easily replaceable. Understanding the format in which the Standardized Headset Identification System (S.H.I.S) is written will not only allow you to correctly identify the required headset for a particular frame, but also to correctly identify the fork steerer dimension. For example a frame with a straight chamberless headtube requiring a ZS44/28.6EC44/33 headset also requires a fork with a 28.6mm to 33mm tapered steerer, more commonly referred to as a 1 ⅛ to 1 ¼. If a customer walks into your shop with a pair of eeBrakes installed on his or her bike, the easiest way to identify the newest Generation 4 eeBrake is the black torsion spring that spans the front face of each brake. Even the new chainstay specific direct mount received this (among many more) updates with the 4th generation eeBrake!The stronger black springs increase the amount of feel and modulation during heavy braking, especially on frames with less than ideal cable routing. The rider’s saddle position should be carefully accounted for when setting up any of Cane Creek’s Thudbuster or eeSilk all road suspension seatposts. Saddle offset and height may need to be adjusted to compensate for suspension sag. The parallel design of the links that make up each post means that suspension movement doesn’t interrupt the rider while pedaling. Cane Creek enjoyed and is grateful for the time spent with the mechanics who attended the Professional Bicycle Mechanic Association Technical Workshop in Atlanta. 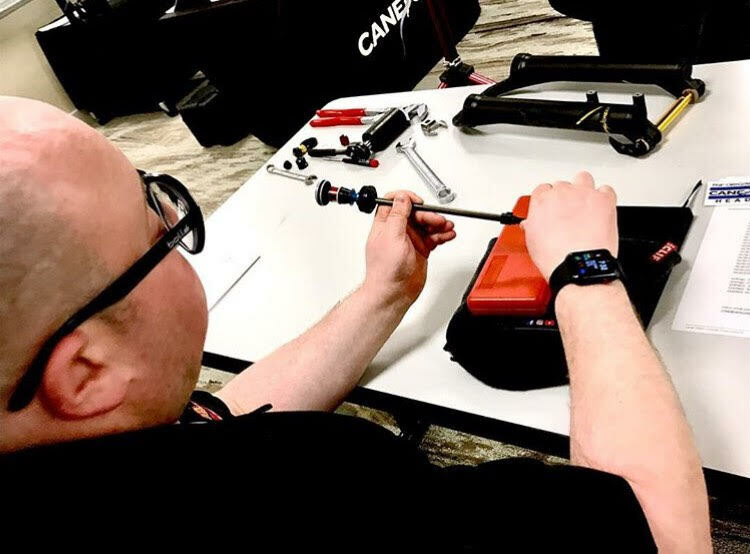 Alex and Andrew hope that class discussions helped all attendees to become even more confident while identifying, installing, servicing, and using Cane Creek products. Cane Creek from PBMA on Vimeo. Photos provided by PBMA/Jesse Capsten. To find out more about Andrew, Alex and the rest fo the Cane Creek family, visit Our Team. Frothing for more? Tune in to our Instagram, Facebook, and YouTube channel to learn more about Cane Creek products, tech tips, and the people behind the components.